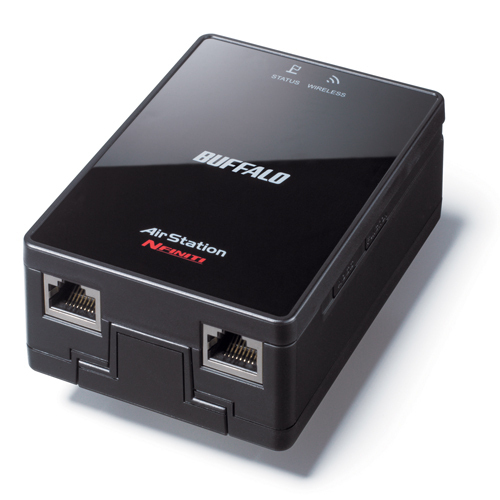 The AirStation Nfiniti™ Wireless-N Dual Band Ethernet Converter, Access Point & Bridge WLAE-AG300N is a versatile wireless device that extends the capabilities of wireless networks by offering three operating modes for limitless flexibility. 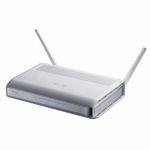 WLAE-AG300N can connect any two wired devices, such as printers, gaming consoles or DVRs, to an existing wireless network. 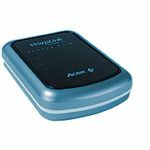 It can turn any wired network into a high speed 11n network, or two or more can used to wirelessly connect and extend the range of the wireless network. 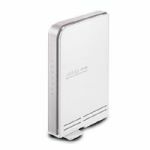 802.11n dual band support allows maximum performance and compatibility providing interference free connectivity, great for wireless video streaming, gaming and other high performance uses. - Designed to IEEE 802.11n specifications. - Wi-Fi Certified™ to ensure compatibility with other certified devices. - Creates IEEE 802.11n (2.4 GHz/5 GHz), 802.11g/b and 802.11a wireless networks. - Wireless connections with bit rates up to 300 Mbps. - Two built-in 10/100 Ports for up to two simultaneous connections. - Push-button secure wireless connections with AOSS™. - Simple web browser configuration, no drivers needed. - Can be moved from device to device without reconfiguration. - Backward compatible with 802.11g, 802.11a, and 802.11b. - Supports WPA2, WPA-PSK (TKIP, AES) and 128/64-bit WEP Security. - For best performance, use with a Buffalo Nfiniti Wireless-N Router. - Great for high-speed multimedia streaming or online gaming.